June 2013, Ramallah, West Bank. In the T.V. 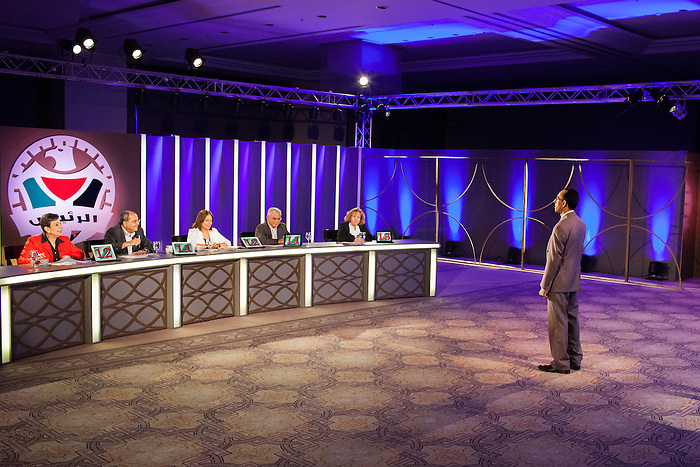 program “Al Rais” (the president), the participant have to compete to be selected as the best fictional president. The question is based on “what would you do if you were the president”. The aim of the program is presented as seeking to raise new interest from the youth in politics. Mahmoud Abbas, the current president, was elected in controversial context in 2005, where Hamas had been given winner but the international community had pressure to keep the Fatah in power. Since then, the political situation has been frozen, and elections have not been yet called despite Abbas’ mandate ended in January 2009, affecting the interest of Palestinians for internal politics and the trust in their representatives.